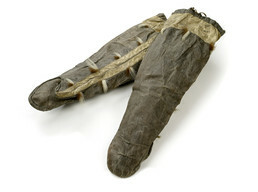 Long sealskin mittens like this pair from King Island were worn at sea to protect against cold water. They have drawstrings at the top and decorative tufts of polar bear fur. The reddish-brown color is from alder bark dye, and the white is seal skin that was bleached in freezing weather. Jacob Ahwinona: They’ve got to be a man’s [mittens]. Aron Crowell: Did your father have any long mittens like this for kayaking? Jacob Ahwinona: Not that I can remember. They were not that long but shorter. The ones I seen, they were always about half the size of that, on the length. Aron Crowell: Long enough to go over the end of their raincoat? Jacob Ahwinona: Yes. Long enough to go right here, not over the elbow. Jacob Ahwinona: This has to be polar bear. We had polar bears from years back. Marie Saclamana: What is the red fur? Estelle Oozevaseuk: Unborn seal [skin]. Dyed. Marie Saclamana: And bleached seal skin. Branson Tungiyan : And ugruk [bearded seal]. Shaved, hair shaved. Marie Saclamana: It is shaved seal skin because ugruk skin is real thick. Estelle Oozevaseuk: There’s something in between [the seam] inside. It’s sewn from the inside, with little piece [of something] in between those pieces. Yeah, and these are kaleftaq [small straight stitches] . . . . I know that these are tree bark. Nowadays, we use crepe paper. Branson Tungiyan: Iwhaanitlu atullghitat dye-esiiluteng? Kavighyaaget? Estelle Oozevaseuk: No. The only thing is tree bark. Tree bark have been stripped off when it’s green and let it dry in sun¾it turns red, kind of that color. Kavighyaaget [red ochre] is not, that’s red clay, we never use it for dye, only with a smearing up. Just pound them up and mix it with water. And just paint on whatever you want to.